David Caswell was a District Governor and Rotary Foundation Chair and his widow, Valerie, gave this trophy in David’s name to present to the club that showed the greatest improvement in support of Rotary Foundation activities each year. Woodstock & Kidlington run a successful 100 Club to raise funds to support Alan Wolstencroft’s work for schools in Sierra Leone. Last year they were awarded a District grant for the first time in quite a while to help with this important work. In the first 2 years the club has raised over £5000 for this vital work. After the the schools purple art competition winners were announced, an idea of using the artwork to raise funds for the polio campaign by converting them into notelets was suggested and subsequently agreed. 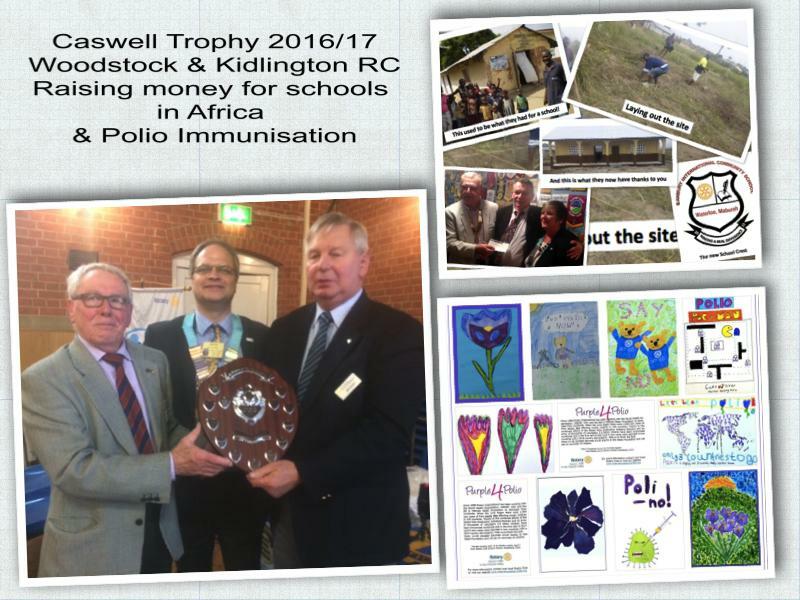 This project has been a joint venture between Bill Carss and Bob Taylor in the Woodstock & Kidlington Club and our District polio team. To date some 340 packs of notelets have been sold raising nearly £800 for polio eradication which will become £2,400 thanks to the Bill & Melinda Gates Foundation and will pay to fully immunize well over 1,000 children. These two initiatives in particular resulted in the Club receiving the Caswell Trophy. The picture above shows David Thompson, President in 2016/17 giving the proceeds of the 100 club to Alan Wolstencroft founder of AlansAfrica projects and examples of the childrens purple art work now produced as notelets. Bill Carrs and Bob Taylor key drivers of both initiatives receive the Cup!